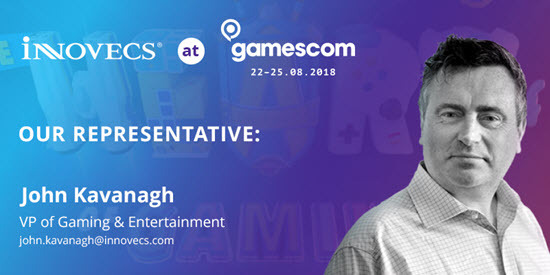 John Kavanagh, VP of Gaming & Entertainment at Innovecs, is heading to Gamescom 2018. So far, it is the most popular European gaming show, which is due on August 21-25. This time, the event venue is Koelnmesse, the biggest international fair and expo center located in Cologne, Germany. According to the official news released, the place will accommodate a multitude of big names like Bethesda Softworks, Nvidia, Nintendo, and Ubisoft. On top of the famous software exhibitors, Gamescom 2018 will also host a lot of renowned hardware gaming providers including Asus and HP. That said, the event must be really exciting with dozens of new game titles to be announced and plentiful hands-on demos to be shown.